In My Mailbox is brought to you courtesy of The Story Siren. Each week I will let you know what new Young Adult (YA) or Middle Grades (MG) books made their way into my house. 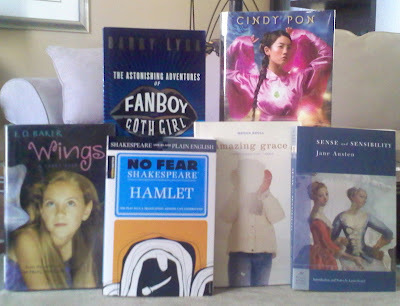 These are books I bought, begged for, or borrowed and will be happy to read some day! I'm trying to cut back, again, on buying so many books. I did well this week! Amazing Grace by Megan Shull - @ellenpotter tweeted that she'd read this book several times. 'Nuff said. Working in a library is dangerous and not because of the kooky patrons. I did better this week and only brought home two books. Wings by E.D. Baker - I've read Wings by Jason Lethcoe, I'm reading Wings by Aprilynne Pike, this will complete the Wings Trifecta! Silver Phoenix by Cindy Pon - she is a Word Ninja! oh wow! awesome week! i loved the begged feature! ha! happy reading! Oooh. NIce books this week. Hope you enjoy them! Great books this week! I hope you like the Lyga book, I really enjoyed it when I read it a few months back. I can't wait to read Wings and Silver Pheonix as well! Great books you got this week, they all look really interesting. Enjoy. Thanks for the list. My bedside list grows daily. Now I have to stay awake long enough to work my way to the bottom.